We offer a number of art classes to accommodate your busy schedule. The classes are small and informative and foster creativity while developing skills. All classes require pre-registration (BUT not pre-payment) You may join any time. We change the subject of the paintings each evening. Reference our event CALENDAR. All classes are work at your own pace. Plan to arrive sometime within the time frame of the class, giving yourself at least an hour to complete your masterpiece. Wednesday and Friday afternoons are for kids (11am-2pm! 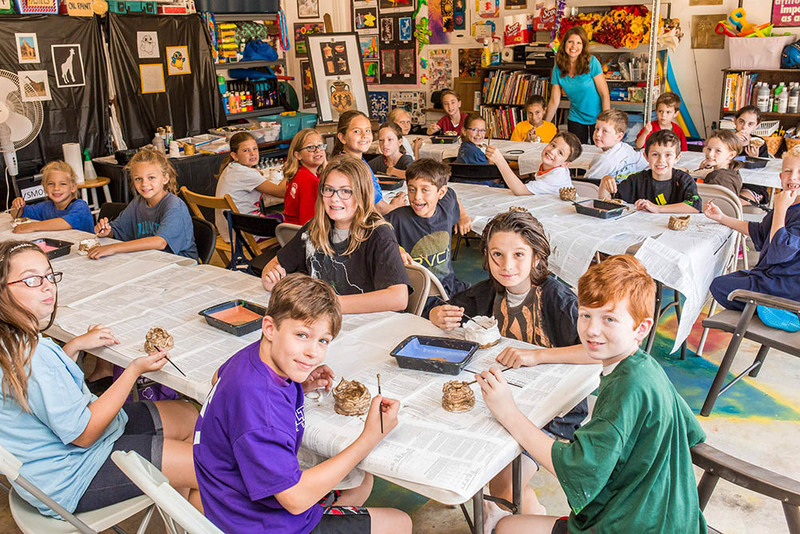 Classes vary and boast a number of hands on crafts and art projects. Parents must accompany children 11 and under, but we have activities for you too! Learn simple tie dye and shibori techniques to create one-of-a-kind textures, colors and patterns. Includes tools & choice of 2 T shirts or a tapestry! All skill levels welcome.. If you would like to sign up for an additional class (tie dye 2) you will be shown how to paint a design over your creations for a truly customized, one of a kind creation. This is a WET class. Wear clothing you won’t mind getting wet, or dye on. Please pickup your dried projects the following day, or we can ship to you for a small fee. IF you are taking a 2 part dye class you will leave your creation at the studio. Adult and children’s sizes available for tie dye workshop, please specify size and items you’d like to dye at time of reservation. This course emphasizes artistic development in a relaxed and fun studio environment with a variety of music to keep you motivated. Regardless of your level of training or ability, you work on your own projects, using any medium you choose, in this self-paced class. You are encouraged to pursue individual interests and further develop your unique style. The instructor is available for guidance, motivation and demonstrations of technique. There will be class demos as well as individual assistance. Bring your painting supplies and reference materials to the first class sessions and be prepared to work. This is an on going class that offers a lot of flexibility for the students. You attend a total of eight classes (28 HOURS!) for only $400. Classes must be completed within a period of two months. You will be able to store your supplies in the studio. Please contact the instructor with any questions about materials and what to bring for the first class. Class size limited to 5. Email abeartstudio@gmail.com for more information. ABE ART IS OFFERING ART CLASSES IN SPARTANBURG SOUTH CAROLINA THIS SUMMER! Sign up NOW!